After a flurry of retweets, an emergency general assembly was called Saturday evening with around 20 participants, according to Michael Smith, a Seattle resident involved in the movement. “(The police) always say it’s the university, it’s the higher ups, or it’s the chancellor (giving orders),” said UC Berkeley sophomore Elana Eden. A UCPD spokesperson was not available for comment. After the general assembly, members of Occupy Cal began moving supplies and items, according to senior Adam Braman. Around 4 a.m., police officers returned and began to reinforce the no-sleeping rule, Braman said. Protesters are not allowed to sleep on the steps of Sproul, but the rule has not been regularly enforced, according to Eden. At about 7:20 a.m., cleaning crews began taking down signs, posters and artwork and using a power hose to spray the chalk and paint, Braman said. 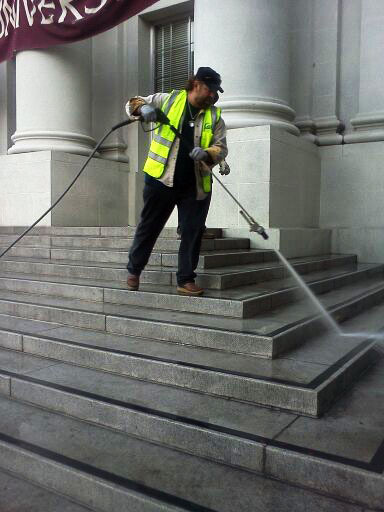 Cleaning crews pressure washed the steps and facade of Sproul Hall on Sunday morning. A sign across Sproul Hall pillars stating “Welcome to the Open University” was the only physical reminder of Occupy Cal left around 9:00 a.m.
By 11 a.m., the word “love” had been written in chalk on Sproul Hall pillars and a cardboard heart, two chairs, a few flowers and a sign were left on the steps. Another general assembly is planned for Monday to discuss the immediate future of Occupy Cal, according to Eden.